When they first called it “the holiday season,” they really should have thought about naming it “the cozy season” instead. With November comes promises of stuffing and pumpkin pie, and our attention naturally turns to everyone’s favorite holiday for eating and gathering—Thanksgiving. There are aspects of Thanksgiving that can admittedly feel a bit stressful: aligning schedules so that all the family members can attend, perfecting that cranberry sauce recipe, taking time off from work, even though that stack of papers looms on your desk. But at the heart of Thanksgiving, there are the big things that overcome those little things–togetherness, warmth, and love. And you can set the scene for this snug, sweet occasion, wrapping in farmhouse touches throughout your home’s décor. Farmhouse is a design style that easily lends itself to simpler times and nostalgic feelings of home. Through vintage treasures (with maybe a family heirloom or two woven in), soft, delicate neutrals, comforting fabrics and textiles and of course, plenty of autumnal details, you can create a bygone atmosphere that will make your guests feel truly welcomed and at ease. Here, you’ll find 10 inspiring ideas for turning your house into a farmhouse this Thanksgiving. 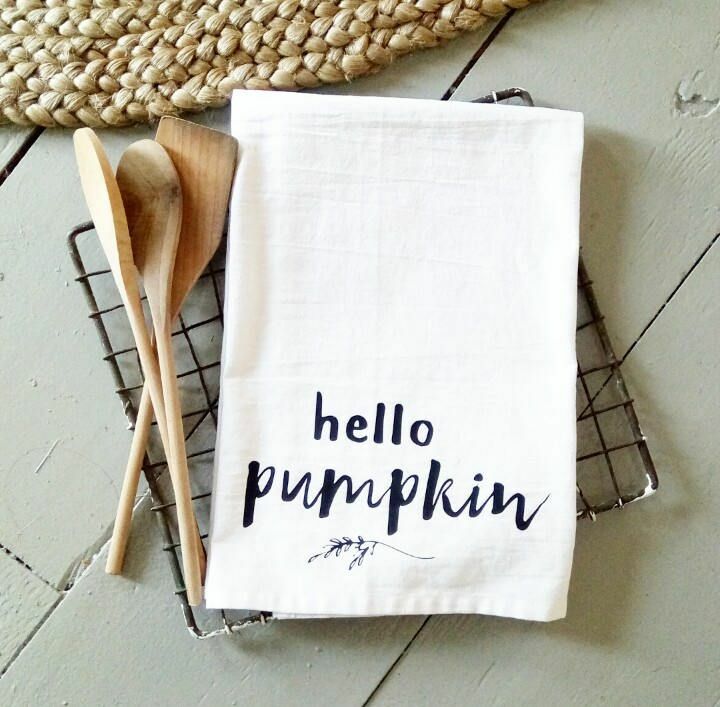 This Hello Pumpkin Cotton Towel is from Three Arrows Co.
A quote or beloved phrase is a creative way to greet your Thanksgiving guests as they walk in the door. You can use a roll of butcher paper and twine to display these words, perhaps trying your hand at calligraphy (like Liz Marie did above) or keeping it easy by using your familiar, everyday handwriting. Your kids can even get in on this, asking them to write some pleasant words on the paper as well. Dream up inventive ways to spotlight your vintage items this season, such as taking a weathered, well-loved box and turning it upside-down to display pumpkins and other gourds, like this one from Lauren McBride. Antique pieces always tell a story, and they’ll be sure to add to the homey scene you’re creating. Swap out your standard kitchen canisters for ones with a bit more farmhouse flair, like these chalk-painted mason jars from Oh My Stars Mason Jars on Amazon. The twine brings in country detailing, and it’s a much more charming way to store your kitchen tools or even a beautiful fall bouquet. Guests love when their hosts go the extra mile and provide those great little extras, like fresh soaps in the bathroom, a favorite magazine waiting for them on their bed or a few warm blankets for the taking. Lean a vintage ladder against your living room wall, like this one from Craftberry Bush, and offer plush throws in fall-friendly shades to your guests. They’re just right for those post-Thanksgiving naps or watching an impromptu game of football in the backyard. This is a unique way to present a table’s place settings. Instead of using place cards, use butcher paper to cover the table and hand letter the names of all your guests like Jessica did above. As they arrive, and before the table has been set, they’ll admire your handiwork and gorgeous table décor. 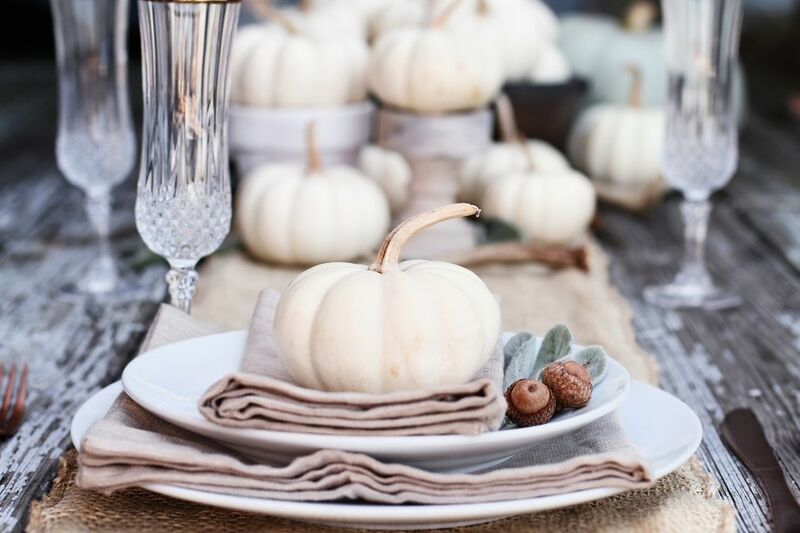 If you typically purchase a faux pumpkin or two to accent your Thanksgiving table, this year, why not go the organic route? Stop by a farm stand and pick up some distinctive-looking pumpkins in varying colors and textures. Here from Liz Marie Blog, the host has brought in leafy branches and pears as well to emphasize the green palette. Replace a few of your year-round photos, artwork, and prints around your home with signs that announce the season, like this wooden sign that simply says “Harvest​" from DWLstudio. It’ll accentuate the autumnal tone you’re setting in your space. A fresh, neutral table can be crafted thanks to worn woods, white dishes, a burlap runner and a few felted acorns sprinkled throughout. Warm golds stand out in this light-colored scene from ​Hello Allison, with bundles of homegrown wheat in tall vases taking center stage. On the couches and chairs in your home, swap in some throw pillows that celebrate the Thanksgiving season. They can feature fitting sayings that guests will love, like this one from Sassy Stitches by Lori, or even just a classic pumpkin or turkey. The kitchen tends to be the official gathering place on Thanksgiving (it is where the food is, after all). Skip cluttering it with tons of décor and look to a basic and lovely way to bring in fall visuals—a tiered stand. Take inspiration from Jolia Willis's one above. You can include farmhouse essentials like a vintage-inspired letter, ceramic pots, and a small plant. If anything, subtle spots of kitchen décor can only help to encourage a soothing mood in the busiest room on Thanksgiving.